A rustic seasonal dish that combines the comforting flavors of fall and Thanksgiving. For the apples, I use granny smith which are very tart and require slightly more sugar, but any firm crisp apple may be used. The brown sugar helps brown and caramelize the apples almost like an apple pie. 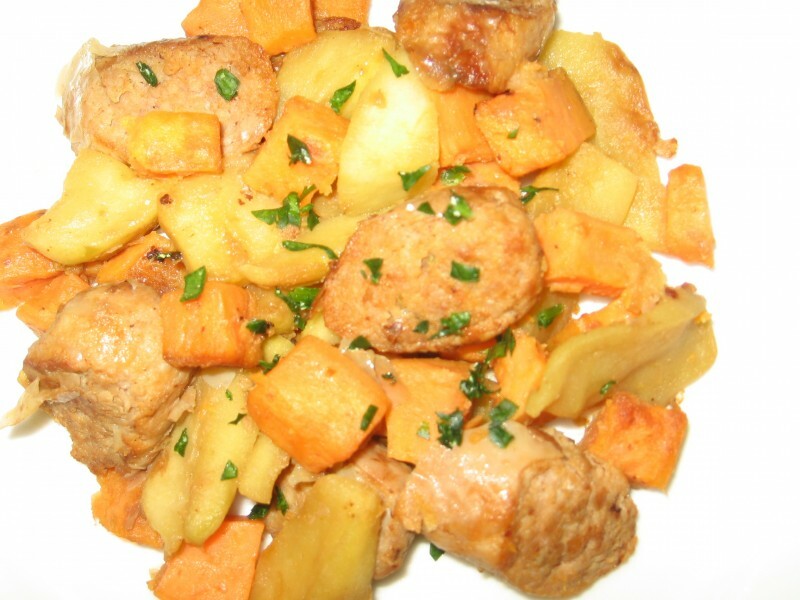 The original recipe from “The Art of Good Cooking” did not have sausage but I found that the saltiness balances the sweet and acidic flavors from the sweet potatoes and apples. The sausage also rounds out the dish to make it a complete lunch or small dinner. While sweet potatoes cook, heat a large skillet over medium low heat. Add remaining butter. When butter has melted, add apples, sugar, and lemon zest. Sautee for a few minutes. Meanwhile, slice the sausage at an angle in 1-2 inch pieces. When apples are slightly browned and dry but not quite soft, add orange juice. Add the sweet potatoes and sliced sausage to the pan. Cook until orange just evaporates and sausage is cooked through. Serve and top with crumbled goat cheese. This sounds fantastic. I love your Grandmother’s recipes. I think they are, in general, my favorites, so I am so delighted to find your site. I have made this recipe on the fly for many years, and have found that if you vary the apples and the kinds of sweet potatoes, it has a very different flavor. I like to use Jewel sweet potatoes with a bronze skin when our family is in the US – but since we live in China, we like to use the beautiful Chinese sweet potatoes they have in the North, fragrant and sticky when cooked. Since we like sweet, we also use Golden Delicious. When the apples and sweet potatoes are sweet, there is no need for further sugar. I plan to try adding sausage. Sounds great! So happy to see you online!